Leaders in the movement toward learning health care systems met in Pasadena, Calif. to create a road map to grow and improve health system-based embedded research programs..
Michael Gould, MD, of the Department of Research & Evaluation addresses the participants at the embedded research conference. Organizations like Kaiser Permanente can make continuous improvements in the quality, safety, and value of patient care and at the same time contribute to scientific knowledge nationally and internationally by embedding researchers in their health care systems. 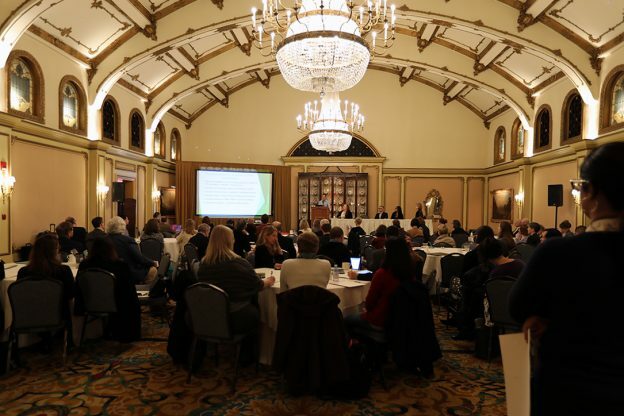 This week, leaders in the movement toward learning health care systems will meet in Pasadena, Calif. to create a road map to grow and improve health system-based embedded research programs. “One of the key features of this research is its goal of generating simultaneous benefits to the host health system as well as generalizable scientific knowledge,” said Brian Mittman, PhD, a research scientist with the Kaiser Permanente Southern California Department of Research & Evaluation and one of the conference lead organizers. “Accelerating the Development of Learning Healthcare Systems Through Embedded Research: Expert Meeting” is being held Feb. 19 to 21, 2019 at The Langham in Pasadena, Calif.
A learning health system is one designed to develop new evidence as an integral part of patient care, and to drive the process of discovery as a natural outgrowth of patient care. Embedded research is a critical part of that system. This innovation recognizes that health systems collect data as part of patient care. Scientists can use that data, to avoid the time-consuming and expensive steps needed to create study-specific data. Those innovations can be shared with physicians who use it for better patient care, which then generates new data. More than 100 people will participate in the conference including Elizabeth McGlynn, PhD, vice president for Kaiser Permanente Research; Tracy A. Lieu, MD, MPH, director of the Kaiser Permanente Division of Research in Oakland, Calif.; and Lucy Savitz, PhD, MBA, director of Kaiser Permanente Center for Health Research in Portland, Ore. The meeting will open with a discussion by industry leaders including Cástulo de la Rocha, JD, president and CEO of AltaMed and Hal F. Yee, MD, PhD, chief medical officer for the Los Angeles County Department of Health Services. Then small groups will meet to identify the range of models available for embedded research, and determine the types of questions, study designs and methods that best balance practice and science. “Our goal is to spur growth in the number and performance of embedded research programs, and, ultimately, to improve the value, benefits and use of health research to improve patient care,” Mittman said. The conference is hosted by Kaiser Permanente Southern California Department of Research & Evaluation and AcademyHealth. Lead organizers include Dr. Mittman and Michael K. Gould, MD, the director of the Division of Health Services Research & Implementation Science at the Department of Research & Evaluation. The conference is funded by the Agency for Healthcare Research and Quality, Patient-Centered Outcomes Research Institute, and the Department of Veterans Affairs Health Services Research & Development Service. Reports and detailed recommendations from the conference will available to the public in coming weeks at the Department of Research & Evaluation’s website.